Wait, 2012? Surely we mean 2013, right? Well, no. Sometimes, a joke made in jest in the 2011 Anime Soundtrack Roundup turns out to be a self-fulfilling prophecy after all. That said, it’s better late than never, especially since it is our raison d’etre to seek out anime which dazzle us with their music and compel us to share what we thought were notable scores from a given year, regardless of how well-known an anime might have been. So once more, as per our modus operandi, we at Anime Instrumentality have gone forth into the chaos and from that soup, skimmed the tastiest bits off to present unto you all the most notable anime soundtracks of 2012. There’s a certain theme in Hyouka which grabs at your attention with its array of energy and enthusiasm. An oddity to say the least given the nature of its protagonist, but there it is. Although works ranging from Bach’s Cello Suite, Beethoven’s “‘Moonlight’ Sonata,” and Gabriel Faure’s “Sicilienne” take up much of the listener’s attention and give Hyouka its dignified air, the anime’s primary composer, Kouhei Tanaka, is no slouch when it comes to delivering a decent outing. It’s the main theme, found in “Door to the Rose-Colored World,” where Tanaka brings a palpable sense of exuberance that elevates Hyouka’s mysteries from being merely mundane to becoming the giddy, delightful experiences they turn out to be. While the soundtrack suffers from consistency issues – the protagonist’s lackadaisical tendencies don’t make for stellar music – tracks like “Kokoro ni Seijaku to Heiwa wo” keep the listening experience enjoyable, urging us to plumb the mysteries the anime presents in greater depth. Or OK, maybe Faure’s “Sicilienne” does slightly better in achieving just that. Space Brothers is 2012’s go-to score for an inspiring pick-me-up. Relatively unheard of in the anime-sphere previously, Toshiyuki Watanabe brings a brilliant soundtrack to the table. The music, with its transitions between lighthearted joy, gentle warmth, and quiet introspection, is reminiscent of other soundtracks for anime with similar themes (see 2011 notable Chihayafuru). Nevertheless, Watanabe takes a fresh and unique interpretation on these motifs of striving towards the future and personal growth. For one, Watanabe’s music is lightly nuanced with traditional pastoral themes. This is most obvious in “Danny Boy”, an aching trumpet rendition of the Irish folksong by the same name, and “Sharon”, a warm and contemplative jaunt through fields of nostalgia. Watanabe also gives us one of the more memorable themes of the season in the soundtrack’s flagship track, “Space Brothers’ Theme”. The upbeat electric guitar belts out the theme with bold confidence, fading into a slow string harmony that is more subtle, but just as warming. I’ve long maintained that it’s more difficult to craft a compelling soundtrack that paints the realistic subtlety of the everyday than one that depicts boisterous grandeur. The latter can often pass the human litmus test of authenticity so long as it conforms to certain expected caricatures of swashbuckling adventure. The former undergoes much more scrutiny; we are all tenured professors of the mundane simply because that’s what we are faced with the vast majority of the time. It is much harder to be impressed with something you are familiar with. The score to Wolf Children, then, is impressive not because of dazzling illustration of glorious spectacle but rather the depths of the everyday human heart it lays bare. The incessant worry of a mother for her children, the ache of a young girl’s first heartbreak, the small, proud victories of a boy’s first steps to adulthood – these are the things we many a time dismiss as commonplace and ordinary, yet they are just as often the treasures we hold most dear. Takagi Masakatsu’s score shines a light on these modest, often overlooked, jewel-like facets of humanity to which we can all relate. To best describe the soundtrack would be to say it wriggles, squirms, downright writhes with a certain organic, lifelike sense of gentle indecision – a warm ebb and flow that’s not doubt but a purposeful hesitancy. In short, the score comes off as utterly human. In an age of cinematic scoring dominated by cold digital blats and precise, calculated syncopation, Wolf Children’s music is beautiful, imperfect, and fragile. It’s worth experiencing. There are no sad songs in this album. None. The closest to it would be “Kakaetari, Yorisottari”, but the quiet plinks of the piano keys and dramatic interplay between the strings suddenly take on a more peaceful persona rather than simply being sad. “Omoidashitari, Kurumaretari” is certainly a tear-jerker, but it’s still not ‘sob in my hands’ sad. This is not to say the album is an emotional black-hole. Using a myriad of strings, woodwinds and piano for this slice-of-life anime, Hamaguchi has crafted this fine balance between tranquil day-to-day (“Maemuki dattari, Hinekurete Mitari”), whimsical (“Akubishitari, Nobi wo Shitari”), uplifting (“Kakedashitari, Motometari”) and yes, heart-tugging (“Yasashisa ni Furetari, Yuugure wo Miagetari”) mix of songs. It’s the perfect album to relax and drink tea with. And no anime about choristers should have an album that has no er… chorus. Disc two fulfils all them choir needs and more, with “Kokoro no Senritsu”, “Radiant Melody” and “Reflectia”, being firm favourites. Not only are they well-arranged, they’re just… so happy. And unpretentious! But mostly happy. And that’s a good thing! Mikio Endo may be new to the anime music scene, but he wastes no time in proving himself with the highly expressive K Project OST. 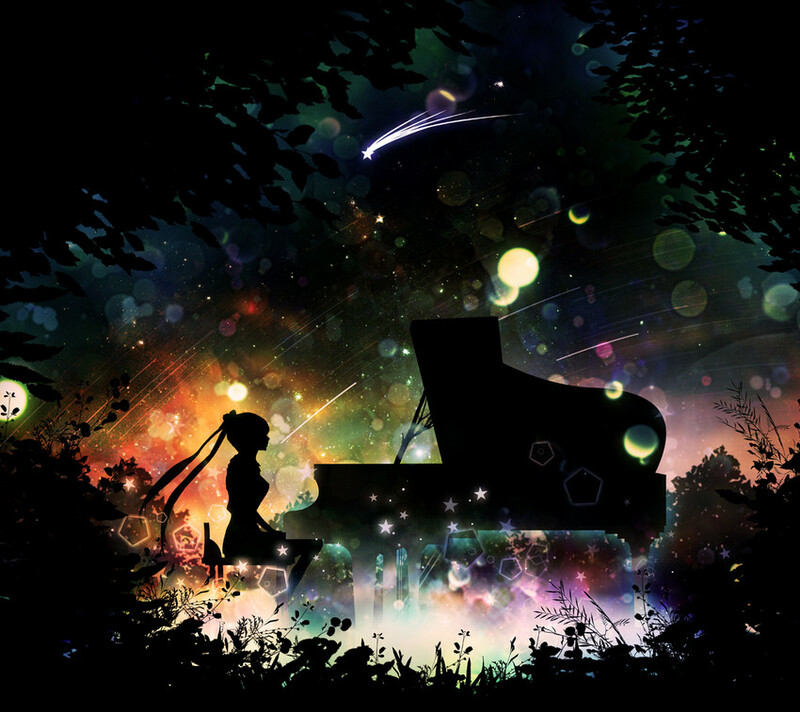 The anime employs a method of storytelling that reveals the fantastical in and around the context of everyday city life and Endo crafts his music specifically to fit within that mold: calmer scenes play out to a backdrop of urban percussive elements with fantasy-inspired violin and piano melodies sailing over the top. Once trouble starts, these twinkling cadences transition smoothly into dark refrains that build tension through low piano bass lines and intensified percussion. The percussion’s style (as well as the piano and violin sprinklings) is fairly uniform throughout the soundtrack, which unfortunately leads to none of the pieces really standing out. However this does allow Endo to move fluidly from one piece to the next without disrupting the action as it plays out on screen. Although the songs individually may not be as memorable, the K Project OST is satisfying and nearly on par with its vivid accompanying animation. Shinsekai Yori’s score draws you into its veil, firmly implanting you in a world that is deeply absorbing and engaging. The music’s discordance, complete with its domineering rhythms and haunted choruses conjure a tragic, discomforting setting, one in which orderliness and protocol are forged through a long history of violence and other heinous acts. That’s not to say it isn’t diverse, but while the music delivers idyllic fare like “Night Canoe” or the occasional electric guitar riff, composer Shigeo Komori’s shines with efforts like “Kage no Denshouka Dai Ichi-bu” and “Sad Song.” The former features the aforementioned haunting choruses which cultivate the heavy atmosphere that lies over the anime as a whole while the latter is a profound lament, one that connects with listeners most poignantly as it exudes an ever-increasing sense of suffering and despair. Michiru Ooshima returns once again to the anime scene with a heavy-hitting score for Zetsuen no Tempest. Having given us amazing music for Sora no Woto, Tatami Galaxy, and Fullmetal Alchemist, Ooshima’s effort with Tempest equals, if not surpasses, her previous works. More similar to Fullmetal Alchemist, Tempest’s classically-inspired music is grander-scale, opting for a somber tone with brooding melodies that writhe in their deep affection. Indeed, every piece possesses a feeling of momentous importance as if relating episodes of a dark and disturbed epic. The main theme, “Zetsuen”, captures this sentiment very well, accurately depicting the essence of the whole score with its powerful and stormy atmosphere. Ooshima even arranges Beethoven’s 17th (“Tempest”) sonata in the fittingly titled track “TEMPEST”, invoking Beethoven’s tortured and moody style to great effect. Psycho-Pass is easily my favourite anime over the past few years, and Psycho-Pass’s soundtrack doesn’t let the anime down the slightest. Its heavily foreboding atmosphere is more harrowing than it is pleasant, but that is precisely what makes it good. The first track, “Psycho-Pass,” not surprisingly, stamps its main theme onto the series, weaving together elements of discordance, action, regret and everything else the show represents. Better still is the way in which the subsequent tracks follow; that is, they’re heavy, but uniform in the way they display their nuances. “Hou to Chitsujo” is tense and conjures up scenes of pursuit; “Haizai Keisuu” and “Haiki Kukaku” utilises the pounding bass lines to rattle the nerves; others like “Amai Doku” are sinister and unsettling. Amidst these, there are also a few acoustic pieces which stand out due to their contrast with the rest of the soundtrack. “Inochi no Arikata,” for instance, is gentle and stirring while still utilising the melodic themes present in the harsher tracks, representing a sanctuary existing within the dystopia. Finally, there’s “Hikari,” which begins feebly with the piano, but slowly builds to depict the light’s determination to shine through darkness whilst transforming others in the process, thereby making Psycho-Pass’s music a transformative experience. If we had a category for the dark horse surprise success soundtrack of the year, Fujiko Mine would probably take it. Springing from the loins of a composer with only two other anime music credits to his name, the score packs a surprisingly powerful punch. Jazz in anime was once novel and fresh but now easily feels played out and stale. Naruyoshi Kikuchi avoids these pitfalls by getting the basics very right. A saxophonist by trade, Kikuchi made a soundtrack that maintains the unpredictability of live jazz without compromising its ability to be good background music. The instrumentation and style of the pieces sound distinctly authentic in a way that a composer simply emulating jazz can rarely reproduce wholly. The score absolutely sizzles with brooding personality. Its rough edges and at times indulgent moments of strangeness occasionally make the tracks difficult to listen to, but a soundtrack that can genuinely take you out of your comfort zone is a rare and special thing. I am always awed by the ability of good soundtracks to transport us to a different setting. JinTai’s does just that, painting a beautifully lush agrarian landscape with its graceful tracks like “Marchen” and “Sato no Hiroba.” These tracks, along with many others, are peaceful and optimistic, which makes the album as a whole extremely easy to listen to time and time and time again. Personally, I don’t remember the last time I looped a soundtrack so many times on end. Take tracks like “Marchen.” Because of its irregular pacing, a lot of what makes it sparkle comes down to the pianist’s expression and interpretation of the piece, bringing forth its aura of grace and simplicity. You also have the occasional ‘epic’ piece like “Dai Sakusen” and “Gekitou.” Both could easily have been depicting a dramatic confrontation of sorts had it not been for the playful notes thrown in here and there to add in that knowing wink or nudge to make it really amusing. Finally, you have the downright mischievous tracks like “Western,” which are just adorable and the boundless jaunt that is “Sato no Hiroba” to delight and enthrall. Every track is unrestrained, and throwing itself pell-mell into the atmosphere it wants to create, and displaying great character and quirk while doing so. JinTai really doesn’t take itself very seriously, and that is precisely what makes it so incredibly endearing. When there’s a Watanabe/Kanno collaboration, a jazz one, no less, it’s understandable to have high expectations. And while Sakamichi no Apollon‘s soundtrack isn’t as far-reaching as Cowboy Bebop’s soundtrack, it’s still a solid album that has very good music within. Kanno’s style is peppered everywhere, with “Kids on the Slope” and “Yurika” featuring her love for playful rhythms, and “Apollon Blue” having the sumptuous instrumentation we all know and adore. It’s familiar ground, but no less pretty. The main stars are, of course, the jazz. You have your standards (“Bag’s Groove”, “Milestone”), which are great pieces, but aren’t well… Kanno enough. They’re a little flat in an album housing such expectations. Then, you hear “Kaoru & Sentaro Duo in BUNKASAI,” a simple enough piece combining three familiar standards (“My Favourite Things”, “Someday My Prince Will Come”, “Moanin”), with themes that are core to the series. With Kanno’s deft arranging, the piece bursts into life with such colour and personality that it’s the standout track which defines the album. It’s jazz, Yoko Kanno style. And like jazz, this soundtrack is flawed, but very well-intentioned. When done right, it’s simply a joy to hear. Straight out of the gate, “Senshadou March: Panzer Vor!” leaves no doubt as to the direction in which an anime about girls partaking in competitive tank battles will go. Its melody draws inspiration from the grand tradition of military marches which stir the soul and get us to cheer for these girls as they work together as a unit to achieve greatness. As the anime proceeds, famous marches like the “British Grenadier’s” march creep in to yield a militaristically authentic experience that, as good as they are, don’t completely overpower some of the quieter moments where the girls enjoy each other’s presence as their camaraderie grows and strengthens. While far from the best the year has to offer, Hamaguchi’s Girls und Panzer soundtrack does just enough to kindle those nostalgic flames to bring a smile to your face as it conjures up the girls’ escapades. Girls und Panzer – Senshadou March Panzer Vor! So the question on peoples’ lips when Aquarion EVOL was released: would it be a worthy successor to the first series? While the answer might be questionable for the anime, Aquarion EVOL’s soundtrack is a definite yes, showcasing, once more, Yoko Kanno’s eclectic touch in genres. Want high octane beats? AKINO has it covered with the hyper-intense “Paradoxical Zoo” and “Fragments of Eve”. “Kagura in the Wilderness” and “a jealous flapper” are hypnotic in their approach to Eastern music. Lush orchestration weaves throughout the gorgeous vocals in “Aquaria Flying in the Sky”, and “My Dear, Your Name is…?” is sublime as a flowing ballad to round up the soundtrack. Then, there are the clever re-arrangements of famous motifs from the previous series. The sombre opening in “Genesis History #2” plays on the same notes found in “First Love Final Love” (from the first series), and in “Genesis Carnival”, after the organ finishes its say, the original theme from “Aquarius” sweeps in with a glorious vengeance. Idiot grin-on-face moment if there ever was one. Chock-filled with great tie-ins and new ideas, this is a stellar soundtrack that has everything for any Kanno fan. As always, this task of whittling down the best anime soundtracks from 2012 came down to those that stood out the most, which means skipping the likes of Tatsuya Katou (who seemingly only has one good track in each of the soundtracks he writes for) and maybe whatever Elements Garden has written up this year. In any case, feel free to plug your favorites, and let us know what you think deserves to be in a best-of of 2012. AKB0048: That’s certainly a pleasant surprise. You don’t suppose I can cheat and have it show up on 2013’s rolls, do you? I guess I shouldn’t overlook someone who composed the score to something on the scale of Tytania! Oasis is especially soothingly quiet and wonderful. Guskou Budori no Denki: Something that I haven’t heard at all. Dreamy track in “Life” in the way it’s slow and easygoing and the main theme is pretty awesome as well. The thing about Driland is that the soundtrack wasn’t released until the second season started airing in spring 2013. The soundtrack even uses the second season’s title so you could totally throw it on your 2013 list if you want. I have to say that I really wish Hirano would have done something like this for Hunter x Hunter instead of for this silly kids show that no one watched. Takaki definitely shouldn’t be ignored when he gets to work with an orchestra. Especially a sizeable one like with AKB0048. He did a wonderful job with it too. These are some very skillful arrangements that border original composition at some points. To think they originate from generic pop songs… Oh, and I won’t be ignoring Kowalewski either. We don’t have a breakdown of who composed/arranged what for this soundtrack but I’m pretty confident that while Takaki handled all the orchestra arrangements, Kowalewski handled the majority of the other tracks (that Oasis track is definitely one of his). The second half of AKB0048 aired in 2013 so it wouldn’t exactly be cheating if you wanted to put it on your 2013 roundup. Budori is very much a hidden gem and I’m not surprised you hadn’t heard of it. It’s a soundtrack by a composer who hadn’t previously done any anime soundtracks for a movie no one has heard of. It’s pretty great music though and it’s nice from a technical perspective too – that orchestral main theme was performed by less than 20 players and yet it sounds so grand. Lot of good memories attached to these OSTs. Listened to most of them many times but there’s a few I never got around to checking out. Thanks as always. I thought Tatsuya Katou’s Horizon scores where pretty damn good…. it’s more his 2013 work which I would give the one good track per soundtrack smear…. Sagisu has really fell off, his Magi work was meh personified.